O.R. ‘Ollie’ Fuller (b. Oct. 5, 1880-d. Aug. 20, 1946) was a Los Angeles-based automobile dealer and bus line operator who held the city’s Auburn distributorship from 1923 to 1932 at which time it was taken over by Errett Lobban Cord. 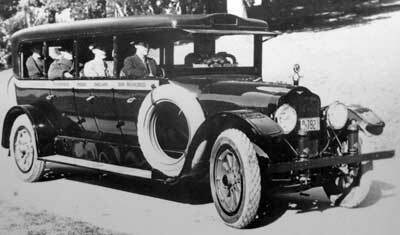 During those years his firm constructed hundreds of motor coach bodies as well as two custom-bodied Cord L-29s (one, an awkward-looking L-29 coupe originally built for E.L. Cord, survives, unrestored in Canada) and at least one Auburn Hearse. 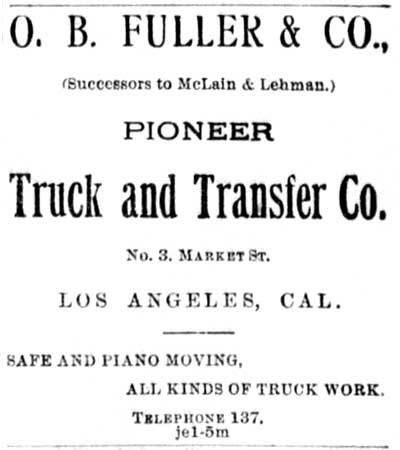 Fuller started his business career working for his father’s draying concern (Pioneer Truck and Transfer Co.) which he helped parlay into a one of Los Angeles’ largest trucking concerns. 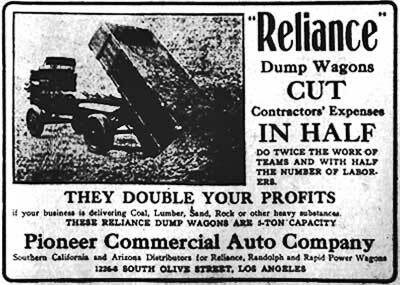 In 1907 Fuller was awarded a Cadillac distributorship for Fullerton, and in 1909 he returned to Los Angeles to manage a motor truck sales organization that at one time or another held franchises for Randolph, Rapid, Reliance, GMC and White trucks, and White, Stephens and Auburn automobiles. 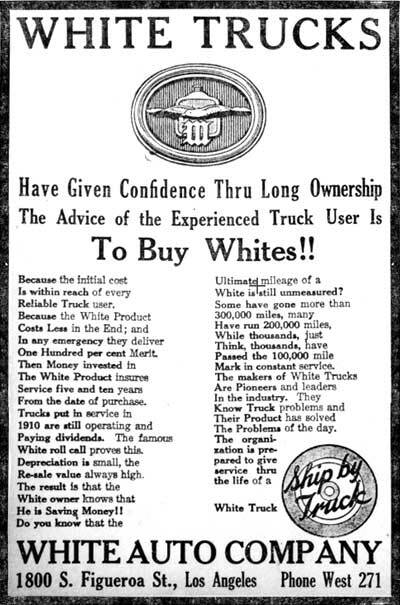 Prior to the start of the First World War he turned two repossessed White trucks into a small freight business which after adding a bus line (White Bus Line) expanded into an enterprise (Motor Transit Co.) he sold for $3 million in 1930 ($40 million in today’s dollars). Established in 1909, the Pioneer Commercial Auto Co., originally located at 1226-1228 S. Olive St. – later at 1017-1019 N. Alameda St., was reorganized as the White Automobile Co. in 1916 and increased sales of motor trucks resulted in a move to 1800 S. Figueroa St., in the heart of LA’s automobile row. 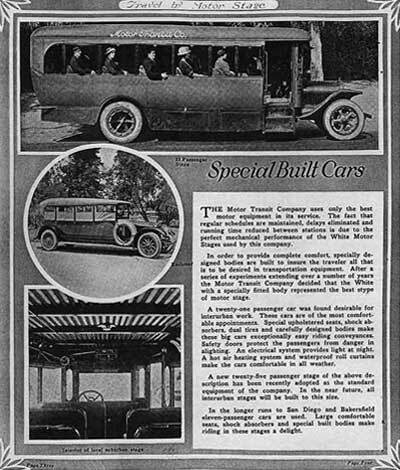 Fuller continued to expand his automobile business during the 1920s, becoming Southern California’s largest distributor of White trucks and motor buses, many of which were delivered with bodies constructed in his own coach works. By 1928 the sales of Auburn passenger cars, which were added in 1923, attracted the notice of Errett Lobban Cord who made a substantial investment in the firm, which was subsequently reorganized as the Auburn-Fuller Co. Auburn-Fuller became very successful and during the next several years established additional satellites in metro Los Angeles: 1101 S. Figueroa St., 1800 S. Figueroa St., 3465 Wilshire Blvd., 6145 Hollywood Blvd., Beverly Hills: 208 N. Canon Dr., San Francisco: 1147-1155 Van Ness Ave., and Oakland: 2111 Webster St., California. 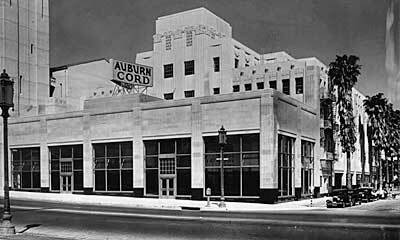 Unfortunately the Depression wrought havoc on Fuller’s finances and the Auburn-Fuller Co. went bankrupt in 1932. 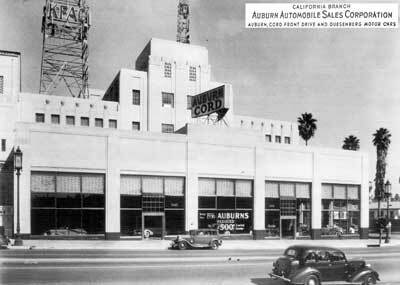 Its assets were acquired by E.L. Cord who relocated most of its operations into a magnificent showroom located in the automaker’s new multi-story art-deco office building at 3443 Wilshire Blvd. By the end of 1932 O.R. Fuller had either sold off, or had been relieved of, his transportation-related businesses and he withdrew to his family’s 3,000 acre ranch north of Corona, California where he remained until his death in 1946. The family patriarch, Henry Harrison Fuller (b.1832-d.1903), was born in Buckstown, Somerset County, Pennsylvania on June 22, 1832 to Henry and Drusilla (Shockey) Fuller and moved to Grantsville, Allegany County, Maryland when he was 10 years old. He was trained as a mason but upon reaching his majority went into the mercantile business with his older brother, Elijah Fuller. On February 26, 1854 he married Mary Ann Morewood, and to the blessed union was born seven children. The first, Anna Losta Delana Fuller (b. Mar. 3, 1855), was born in Maryland, the remaining six were born in Mt. Pleasant, Iowa after the family moved west in 1855: Charles Henry (b. Oct. 14, 1858); Mary Drusilla (b. Dec. 8, 1860); Ortus Benton (b. Sep. 5, 1865); Ernest Pearl (b. Feb 16, 1868); Walter F. (b. 1870) and Grace Vivian (b. Apr. 1873). During that time Henry worked for at a dry goods store in New London, and then ran a large boarding house in Mt. Pleasant for the Iowa Wesleyan University, which included free living quarters for his family. During the administration of President Ulysses S. Grant (1869-1877) Henry was appointed Indian Agent at Lemhi, Idaho and he held that position for six years. Upon completing his appointment, Henry visited the Philadelphia Centennial Exposition (1877), where he decided to visit Los Angeles, California in the hopes of moving his family there. However he decided to postpone the move and returned to Mt. Pleasant, Iowa where he re-entered the mercantile trade. On Nov. 20, 1879 his eldest son, Charles Henry Fuller, the father of our subject, wed Mary Ann (Maude) Spencer and relocated to Beaver, Kansas where they established a small homestead. The union resulted in the birth of one son, Olive Ransome Fuller, who was born in Beaver, Smith County, Kansas on October 5, 1880. Charles and Maude’s marriage was an unhappy one and shortly after the birth of O.R. (as Oliver Ransom preferred to be called) they divorced and Charles returned to Mt. Pleasant, Iowa to live with his family. Mary Anne (Maude) and her young son, O.R., moved in with her parents and in 1887 she remarried (to George Maddy) and moved to a farm in Waco Township, Sedgwick County, Kansas, a southwestern suburb of Wichita. For the next decade O.R. lived and worked on his stepfather’s farm, receiving little more than a rudimentary education. In 1882 O.R.’s biological father, Charles H. Fuller, purchased a 200-acre ranch in Azusa, California (present-day Glendora, approximately 18 miles northeast of Los Angles) and in 1883 brought his family west, for many years engaging in the growing of oranges. The 1884 California Voter registration record and Los Angeles County directories lists O.R.’s father Charles H. Fuller and his grandfather, Henry Harrison Fuller, in Azusa, their occupation being farmers. Also listed in the 1884 Los Angeles County Directory is Azusa resident Fred Zuker (aka Zucker, b.1851-d.1911), a German immigrant (arrived in 1860) who would marry Charles H.’s sister, Mary Drusilla Fuller (b.1860-d.1945) in 1886. In addition to raising orange and eucalyptus trees, Henry, the Fuller family patriarch, also served as the local tax collector for the County of Los Angeles. He passed away on March 4, 1903 from the results of an injury he sustained on Feb. 26, 1903 when he was severely injured by a horse. In 1886 the two eldest Fuller boys, Charles Henry (O.R.’s father - b.1858-d.1929) and Ortus Benton (b.1865-d.1922) Fuller, relocated to the growing city of Los Angeles to seek their fortunes. Both are listed in the 1888 California Voter registration record at 141 S. Hill St., Los Angeles, their respective occupations, laborer, and contractor. 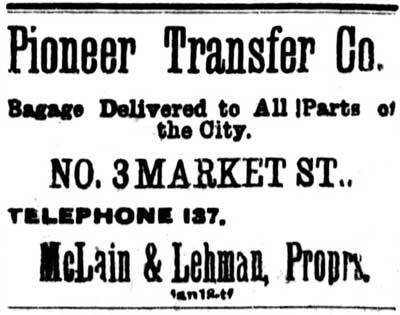 By that time the Fuller brothers had gone into business with their new brother-in-law, Fred Zuker (aka Zucker), purchasing a transfer company from George P. McLain (1847–1930) and Martin Lehman (1851-1917). 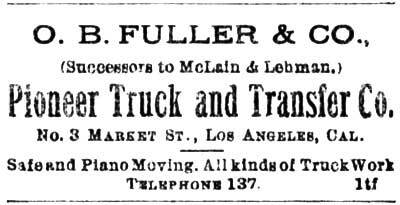 McLain and Lehman, two Los Angeles theater managers who were also partners in the City Bill-posting Co., founded the the Pioneer Transfer Co. (aka Pioneer Truck Co. / Pioneer Truck & Transfer Co.), 3 Market St., Los Angeles, in 1883 to transport performers' luggage, cargo and instruments (including pianos) from the docks and railroads to theaters and hotels. McLain was well-connected politically and after the sale served on the Los Angeles City Council (1889 to 1891 and again 1901-to 1902), Fire Commission (1893–1895) and Police Commission (1897–1899). 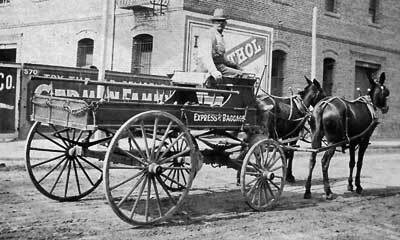 By that time Pioneer’s teamsters transported luggage and cargo to and from the docks and railroads to theaters, businesses, warehouses and hotels in and around Los Angeles. As their business expanded the Pioneer Truck & Transfer Co. expanded into the ranching business and began acquiring land north of Corona, California near the Santa Ana River where they grew the hay and bred the mules and horses required in their draying operations. By 1889 the Fullers had acquired almost 3,000 acres of property which became popularly known as the Fuller Ranch. “Fuller & Zucker, (C.H. 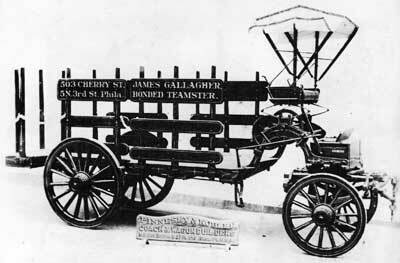 Fuller, F. Zucker) Pioneer Truck and Transfer Co., 150 Market St. Soon after reaching his majority, Charles and Ortus Fuller’s younger brother, Earnest Pearl Fuller (aka Earl, b. Feb. 16, 1865) moved from Azusa to Los Angeles where he went to work for his brother’s various enterprises. “The Fuller ranch, located northwest of Corona, is owned by the Pioneer Truck Company of Los Angeles, and those who have not visited the property have no conception of its magnitude. “The ranch consists of more than 5,000 acres of land, and is devoted to hay and stock raising. To irrigate this vast tract 1,000 inches of water is required, the greatest portion of which flows through a large ditch from the Santa Ana River. The balance is supplied by a 64 horse power engine, which raises 380 miners’ inches, the plant being in continuous operation. To add still further to the supply, another well will soon be drilled and an additional engine installed. “The present crop on this big ranch consists of 500 acres of alfalfa, 1,500 acres of barley, while 500 acres is devoted to other products, such as corn, melons, beets, and garden truck, and the balance is in pasture. “Last year, in addition to the home ranch, the company rented a dry ranch three miles north of Corona, consisting of about 2,000 acres, which was sowed to barley and cut for hay. This hay was baled and shipped to Los Angeles, the daily output from both ranches averaging eight cars per day for several weeks. Some idea can therefore be formed of the large scale on which this ranch does things. Still another ranch the company rented was on the Yorba estate of 2,700 acres, near Fullerton. “Another ranch of still greater proportions is one near Santa Barbara, 15 miles long and six miles wide. This is devoted exclusively to stock-raising, where are cattle, horses, and hogs by the thousands. “There are now on the home ranch about 1,300 head of swine, the greatest portion of which will be shipped to the Santa Barbara ranch, where they are fatted on the pulp from a sugar beet factory. “In the horse line the company has the best the country can produce or that money can buy. At present only brood mares, stallions, and work animals are on the ranch, the others being in Los Angeles or on the big ranch at Santa Barbara. “Before entering further on a description of the horses raised and owned on this ranch, attention should be directed to the two classes of fast horses raised, thoroughbred and standard. As many do not understand the difference between them, it may be explained that the thoroughbreds are running horses, while the standards are trotters. Of the standard horses there is a stallion that has made a mile in 2:15, and a young filly has made the same record. Of the thoroughbreds there are not very many on the home ranch, as they have been shipped to the ranch in the north. However, there are some beauties to be seen here, some of the young colts being valued at $1,000 each. “There is on the ranch a herd of 60 pure-bred French brood mares, said to be the largest herd of their kind in the United States. Some of these animals were imported from France, and their progeny cannot be beat anywhere. At the Pasadena horse show last February these mares carried away all the prizes. “There is a black Percheron stallion on the ranch that weighs 2,105 pounds. This horse won the first prize at the State Fair at Sacramento in 1904, when he was only four years old. This fact is all the more remarkable when it is considered the horse came into competition with the best stallions California could produce and was also a stranger in the capital city, as well as the man who had it in charge. It was a clear case of merit. “A son and daughter of this horse weigh 1,685 and 1,525 pounds, respectively. He is also the sire of a span of three-year-olds that trip the scales at 3,825 pounds, there being only 25 pounds difference in their weight. Another span of these colts, less than one year old, weighs 2,510 pounds; and so on down the line. “The buildings on the ranch include the superintendent’s house of nine rooms; the dining room for employees, 20 by 60 feet; and two barns, 80 by 100 and 40 by 80 feet respectively. The barns have a combined capacity for housing 80 horses. “To handle the hay crop there are 32 mowers, 16 rakes, 4 stackers, 14 buckrakes, 3 headers, and 4 balers. From 15 to 30 men are employed to conduct the activities of the ranch. “To operate this ranch on a paying basis requires skill and executive ability. This duty devolves upon W.W. Cochran, who has been its manager and superintendent for the past six years. How well he performed his duty is attested by what he has done and the results achieved. In 1905 O.R. Fuller married a Fullerton, California native named Agnes Nicolas and moved to the Olinda Ranch, a 4,400 acre parcel located nearby that was owned by a Los Angeles syndicate who exploited the land’s abundant oil reserves. Fuller leased a small portion of the ranch to raise hay for his father’s ever-expanding stables, and with his brother-in-law, Peter Nicholas, opened a livery business at 201 S. Spadra St. that in addition to horses and mules offered dry goods, feed, and building materials to Fullerton locals. Like many young men O.R. Fuller caught the automotive bug and in 1907 was appointed the local agent for Cadillac automobiles and renamed his livery business to the Eureka Stables and Garage. “State of California, county of Los Angeles, ss. 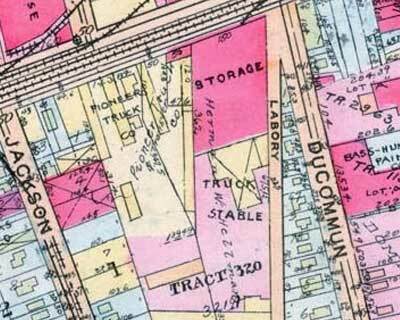 "Beginning at a point In the easterly line of Alameda street, at the southwest corner of the tract of land described in the deed from Jose Perez and wife to Henry Wartenberg, recorded in book 11, page 56 of deeds, records of said Los Angeles county, and being one hundred fifty (150) feet southerly from the intersection of said line of Alameda street with the southerly line of Labory lane; thence easterly along the southerly line of the land so conveyed to Wartenberg south sixty-eight (68) degrees forty-five (45) minutes, east, one hundred ten (110) feet; thence southerly parallel with said line of Alameda street one hundred (100) feet; thence westerly parallel with the southerly line of the land conveyed to Wartenberg one hundred ten (110) feet to the easterly line of Alameda street; thence northerly along said line of Alameda street one hundred (100) feet to the point of beginning. "That immediately upon the execution of said lease and option I went into possession of said premises and ever since have been and am now in possession of the same and the whole thereof. "That immediately upon my taking possession of said premises as above stated I appointed an agent to collect the rents as they became due therefor, and my said agent has accounted to me and to no one else for said rents. That I am a non-resident of the county of Los Angeles, and upon learning that objection was made as to the use charged to have been made of said premises I have ordered all the tenants to remove therefrom, and am taking and will continue to take the necessary steps to have said premises Immediately vacated. I make this affidavit in justice to Mr. Fuller. "I certify that the above statement is true. C.H. Fuller." By 1907, the Fuller Bros. Ranch in Corona was counted amongst the best cattle and horse breeding farms in California. Besides pasture for the horses, hogs and other livestock, large acreages were devoted to barley and alfalfa, much of which was exported, and to truck crops, including corn, melons and beets. Ortus B. Fuller is listed as general manager of the L.A. Warehouse Co., although he’s not listed as being an owner of the firm, which was located at 316 Commercial St. On April 3, 1911, Fred Zucker, the Fuller brothers’ longtime business partner, passed away and his share of the business passed to his sister, Charles H. Fuller’s wife. “In all probability the finest commercial motor car in the world is in Los Angeles awaiting delivery, and it is that hustling oil town, Bakersfield, that will enjoy the distinction of putting it in use for a public purpose. 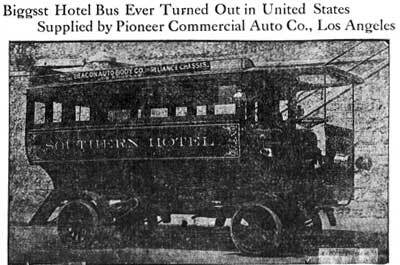 For a sale price of $4,500 the Pioneer Commercial Auto company of this city constructed for the proprietors of the Southern hotel at Bakersfield the handsomest hotel bus yet designed. “The contract called for a Reliance motor track chassis, but the body was built and the equipment furnished in Los Angeles. Its carrying capacity is twenty-two passengers. The upholstery is of best leather with seats and back of the air cushion type. The woodwork is painted in a beautiful brown shade and the running gear black and yellow. The motor is 60-horsepower and is powerful enough to overcome any and all road conditions. Because of recent victories in the great eastern motor truck endurance race from Philadelphia to Atlantic City and return, the tires selected are the Hartfords, and they have been supplied by the local firm of Chanslor & Lyon. The 1910 US Census lists Fuller’s occupation as automobile agent. “New Side Door Randolph Delivery Sold by Pioneer Commercial Auto Co.
“That the man who can afford the expense and yet who holds out longest In making the purchase of a motor car for business or pleasure, is apt to develop into a motoring enthusiast rapidly and one of the best of boosters for motor cars in general, is well Illustrated by the story of a sale of a Randolph delivery wagon recently made by O.R. Fuller, general manager of the Pioneer Commercial Auto company, to a business man In a nearby town. “This man’s business is retailing light and heavy hardware and a large shop devoted to the repair of automobiles, particularly radiators. Having so many leaky radiators coming to the shop had convinced him that the upkeep of a car was decidedly expensive, but becoming more interested in a strenuous demonstration made with a light Randolph delivery wagon, made for a neighbor merchant, and after several months’ watching the service his rival got from his car without any mechanical troubles, he asked for a demonstration for himself and soon closed a deal for a Randolph. 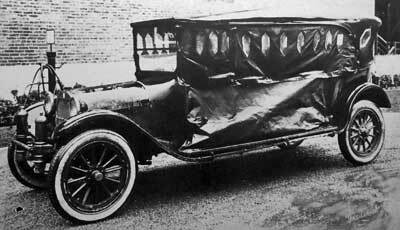 After Reliance merged with Rapid to become GMC in late 1911, E.P. 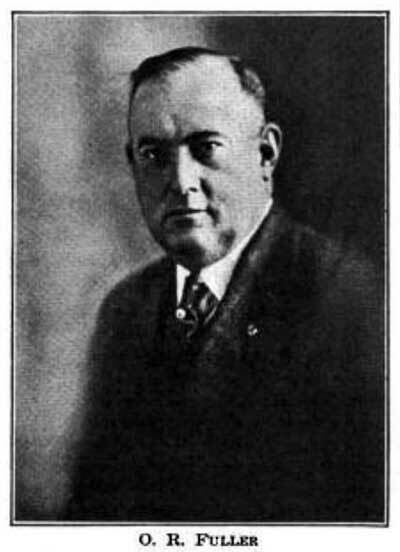 (Edgar Preston) Brinegar, president of San Francisco’s similarly named Pioneer Auto Co., became the Pacific Coast G.M.C. 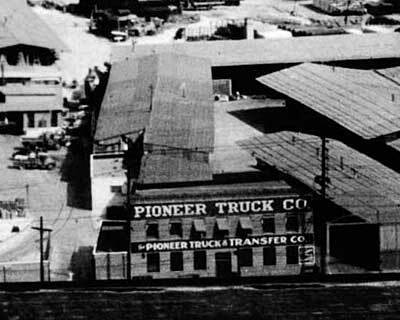 distributor, and organized a new firm, the Pioneer Motor Truck Corp., 515 Van Ness Ave., to handle its distribution. 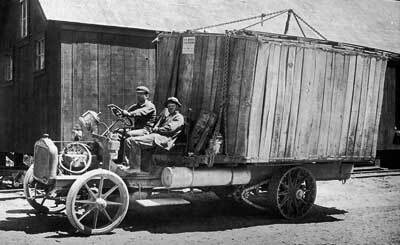 “Regarding the marketing of Trucks on the Pacific Coast, P.D. Tabler, director of sales of the Pioneer Motor Truck Corporation, calls attention to the fact that many more trucks are purchased in Los Angeles than in San Francisco. “Of course, the reason for this is that where they are no more progressive than the citizens of San Francisco, they have a wider stretch of territory to cover, says the Pioneer Commercial Auto Co., who handles the G.M.C. trucks in that city, under the very able management of O.R. Fuller, has placed a large quantity of G.M.C. trucks in that city within the past two years, aggregating something between $250,000 and $300,000 worth. These have been sold to users in all lines of business. “Fuller has a thorough comprehensive grasp of the industrial haulage question, has had wide experience in contracting and has a large and complete building arranged for garaging, repairing and installing the latest devices. He is therefore enabled to consult with his customer regarding his customer needs, give his customer the service that he knows is necessary, and be prepared beforehand for an emergency that he knows will probable arrive, though the customer has probably overlooked it. Now that Fuller had to buy his G.M.C. trucks through a distributor, he began searching for a competing line to distribute. 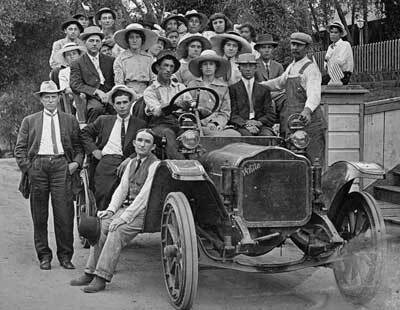 He entered into negotiations with Cleveland, Ohio’s White Motor Co., and in 1913 became the Southern California and Arizona distributor for White automobiles and motor trucks. Later that year he repossessed two new White trucks and instead of reselling them, they were offered to his father on a trial basis, so he could see for himself how efficient they were over his current fleet of horse-drawn trucks and delivery wagons. 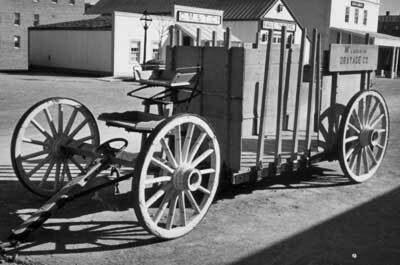 At the end of the year Pioneer Truck & Transfer tabulated their expenses and determined that the motorized conveyances were far more efficient, and began purchasing White trucks for use on some of their longer runs, although they wouldn’t become fully motorized for another decade. “For Ransom? Wealthy Angeleno is kidnapped by Bandits. “Wife, Former San Francisco Girl, Rides All Night to Get Word to His Brothers in this City of Seizure of General Manager of Half-million-acre Santo Domingo Ranch—Authorities Appealed To. “Kidnaped and presumably held for ransom by a band of Mexican ‘red flaggers,’ the whereabouts of E.P. Fuller of this city, general manager and part owner of the great Santo Domingo Rancho, 120 miles from El Paso, and William McCabe of Santa Barbara, the ranch foreman, are a mystery. Mrs. Fuller, who was left alone upon the ranch when the brigands rode away with her captive husband, reached Villa Ahumada, a railroad station twenty miles away, yesterday morning, and telegraphed to his brother’s here. “The brothers, C.H. and O.B. Fuller, president and vice-president respectively of the Pioneer Truck Company of this city and members of the corporation owning the immense ranch, tried in vain during the day and last night to get in communication with their sister-in-law. They will leave no stone unturned in an effort to locate their brother and secure his release. “A dispatch from El Paso last night stated that troops were being rushed from Juarez by (Pancho) Villa officers to the protection of Mrs. Fuller and to secure her husband’s release - indicating that the bandits are not a part of Villa’s forces. The brigands are believed to be the Sanchez Brothers’ gang who have been terrorizing Western Chihuahua and who have worked over to the Mexican Central line to obtain provisions and beef. “In answer to Mrs. Fuller’s appeal, troops are being sent north from Chihuahua on special trains. The troops from Juarez were sent by special request of American Consul Thomas D. Edwards and the Chihuahua at the request of Marian Fletcher, consul at Chihuahua. “VILLA AHUMADA (Mex.) Sept 21. “Pearl (E. P. Fuller) and McCabe were taken by red flaggers yesterday. Have heard nothing from them. No Americans here. “Mrs. Fuller also telegraphed to friends in El Paso and reported seizure of her husband to the State Department in Washington. “E.P. Fuller, accompanied by his wife, went to the ranch about eighteen months ago to manage it. It is well stocked with cattle, and of late Mr. Fuller has been very busy in having them branded. His brothers say the property has brought large financial returns though Gen. (Pancho) Villa has charged them $10 per head for taking cattle across the boundary. 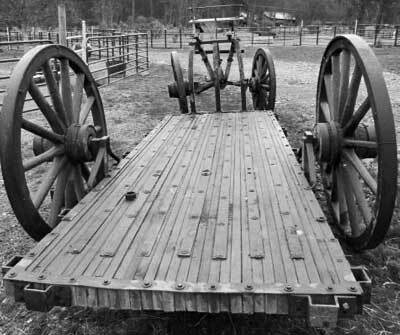 “With slow means of transportation, it is believed Mrs. Fuller probably rode throughout the night from the rancho to Villa Ahumada to get word as quickly as possible to her husband’s brothers. The road is not much traveled, and if she made the trip alone she must have endured a most trying experience. That she has no Americans to whom she can look for protection makes her plight the more hazardous, and her relatives have taken steps to send relief to her at the earliest possible moment. “The Fuller brothers have owned the Santo Domingo Rancho for several years, and have operated it with great success notwithstanding the unsettled conditions in that country. The tract consists of 500,000 acres representing an investment of $600,000. “William McCabe, the foreman, is a well-known former resident of Santa Barbara. He has been in Mexico for a number of years and has had many narrow escapes from the brigands. “Early last week a letter was received from Mr. Fuller and, while he was optimistic over the situation in the State of Chihuahua, he intimated that trouble was to be expected at any time. “Dispatches from Chihuahua say that foreman McCabe of the Santo Domingo ranch, who was kidnapped with the manager, E.P. Fuller, several days ago, is en route to El Paso for $2,000 ransom money to obtain Fuller’s release. Apparently the $2,000 ransom was paid as Fuller is known to have died in 1938 at the age 70, the 1930 US Census lists him and Bertha (whom he had married on Oct. 14, 1914) as cotton farmers in El Paso. Texas. The 1913-1915 LA Directories list O.R. 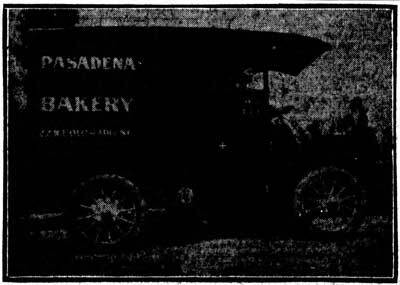 Fuller as president-manager of the Pioneer Commercial Auto Co., Selig Cahn (b.1869-d.1936), sec-trea., 1017-1019 N. Alameda with the 1915 directory adding a satellite facility at 720-722 San Fernando. 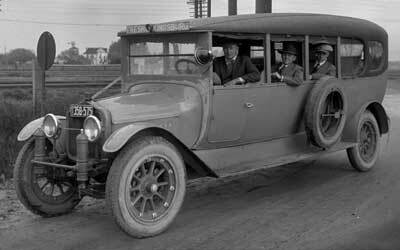 In 1916 the Pioneer Commercial Auto Co. sold two White auto stages to the Package and Express Stage Line (aka P&E), a small operation that connected Los Angeles and Anaheim via Whittier and Fullerton. The firm was forced into bankruptcy following a bad road accident, at which time Pioneer repossessed the 2 vehicles and acquired its routes from the receiver and on December 1, 1916 Fuller organized his recently acquired enterprise as the White Bus Line. 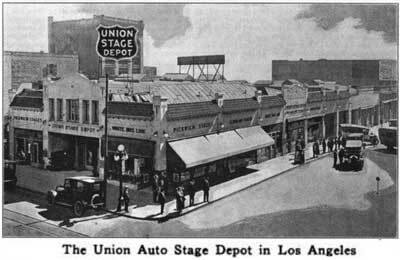 In 1917 he formed the Clark Stage Line, 1017 N. Alameda St, Los Angeles, another automobile stage that ran from Los Angeles to San Bernardino. "The White Auto Co., distributors of White cars and trucks, will have a two story garage, 97x155 feet and costing $50,000, built for them at Eighteenth and Figueroa Sts." “Ground for New White Home Broken. 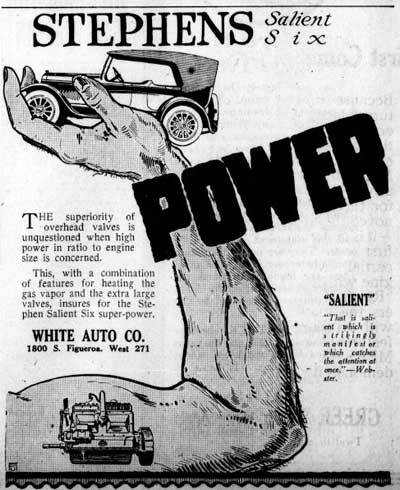 When the White Motor Co. ended car production after WWI Fuller started distributing the Stephens Salient Six, a high-quality mid-priced automobile manufactured in Freeport, Illinois by the Stephens Motor Branch subsidiary of the Moline Plow Co. 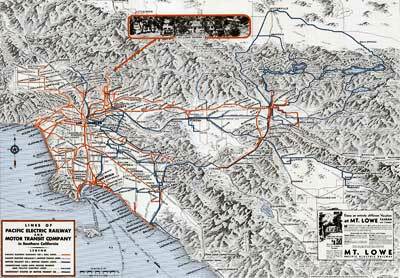 In 1919 Fuller purchased the ARG Bus Co., which operated a route between Los Angeles and San Diego via Santa Ana and by the end of the year he controlled 3 separate bus operations, the White, Clark and ARG lines, creating a network of routes stretching from Los Angeles to San Diego and points East (Ontario, Riverside and San Bernardino). 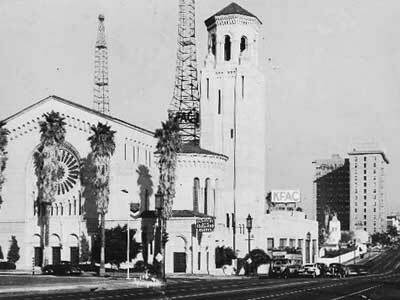 In 1920 Fuller acquired the El Dorado Stage Line, which connected Los Angeles with Bakersfield. Although the distance between the two municipalities was only 45 miles, it required the buses take a perilous route consisting of multiple steep grades and hairpin turns, which took the better part of 10 hours. Bakersfield also served as a connecting point to the San Joaquin Valley and points north so Fuller entered into an operating agreement with two northern carriers - Valley Transit (Bakersfield to Merced) and California Transit (Merced to Oakland) – thereby creating a means of transporting passengers from Los Angeles to Oakland without a transfer. The three firms’ pooled motor coaches would be driven from Los Angeles to Bakersfield by a Motor Transit Co. driver, from Bakersfield to Merced by a Valley Transit driver and from Merced to Oakland by a California Transit driver – all for one low fare. By 1921 the system offered 4 round trips per day. In 1920 Fuller bought out the Mountain Auto Line, a small operation owned by Max and Perry Green that served San Bernardino and the surrounding mountain resorts of Big Bear and Lake Arrowhead, hiring Max on as the Motor Transit system’s traffic manager. 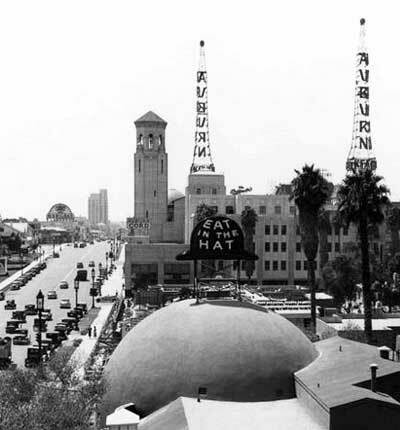 “Two years ago the idea of a Union Stage Depot in Los Angeles, Cal., materialized in the form of an agreement between several auto stage lines and the leasing of a suitable lot at Fifth and Los Angeles Streets, where a structure specially designed for this service was erected. When this was equipped and put in service the number of passengers carried on all participating lines showed a sudden increase - as much as 20 per cent in some cases. 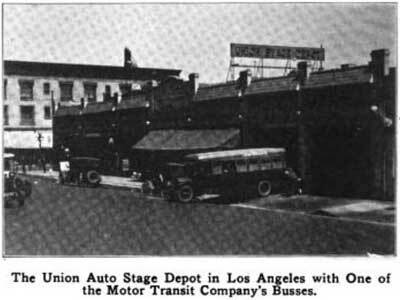 The Union Depot plan afforded an opportunity to impress the traveling public with the extent of the motor bus systems tributary to Los Angeles; it took the small companies ‘off the street,’ reduced their overhead costs and gave to the passengers of all routes alike the conveniences of a steam railroad depot. Although there is no record of the number of passengers going through the depot daily, past records show that in the last nine months of 1921 the ticket sales in this depot totaled $700,000. “The depot is operated by a corporation, the Union Stage Depot, Inc., which was formed for that purpose, one share of stock being issued to each company desiring to participate. At present eight companies are co-operating in this way. Affairs of the corporation are managed by a board of five directors elected annually by the stockholders. These directors elect their own officers, which consist of president, vice-president and secretary-treasurer. None of these are salaried positions. One director, however, is appointed to take active charge of the depot in the capacity of manager, reporting to the board. “The corporation is operated strictly without profit so member companies will not have to pay income taxes on earnings twice. The depot operating expenses are apportioned among the member companies each month in proportion to the amount of ticket sales over each line in the depot ticket office. This is believed more accurately to represent the service rendered by the depot to each company than did the first arrangement, which based the apportionment on the number of schedules each company operated out of the depot. “The monthly assessment on member companies is usually about 3 per cent of the gross ticket sales. This, supplemented by rental from concessions, pays the rental on the property and the salaries of employees. “The latter include nine ticket agents, depot master, police officer (who has the rank of a full-fledged patrolman in the city police department), auditor, information clerk and a general inspector. Each company provides its own starter and collects tickets from passengers, the responsibility of the corporation ceasing when the depot master admits the waiting passengers through the gates to the loading platform. “One or more ticket agents are on duty eighteen hours out of the twenty-four. During the busiest hours six ticket wickets are used. Each company provides its own tickets. Rates on the valley routes are, in general, about 2½ cents per mile one way. Balanced rates are as follows: 2.12½ cents for round trip, 1.87½ cents for ten-ride book and 1.5 cents for thirty-ride commutation books. There are a few competing routes running out of the depot, these being the old lines that were operating before the passage of the act requiring that each route secure a certificate of convenience and necessity from the State Railroad Commission. According to the joint agreement, the ticket agents are instructed to offer the passenger the alternatives of competitive routes and to quote both rates without giving preference in any way. “The concessions in or adjoining the main waiting room include a lunchroom, a cigar and notion counter, drug store, bootblack stand, etc. Office space on mezzanine floors is rented to the Pickwick Stage Company and to the Motor Transit Company. The latter company operates 270 of the buses that daily leave the depot (about four-fifths of the total number) and in addition to the office space finds it desirable to maintain a 60 x 70-ft. space adjoining the depot driveway for use as a service department. This is in addition to the main equipment and repair plant, which occupies a four-story concrete structure at 220 Market Street. The smaller companies operating through the union depot do their inspection and repair work at their respective garages or where their cars are stored between runs. The only service they get at the depot is gas and oil, for which they pay independently of the corporation assessments. “The service department maintained adjoining the depot by the Motor Transit Company includes machine shop, tire room, express room, washing rack, two stationary and two portable gasoline filling stands. Drivers on incoming cars are required to leave on the steering wheel a tag noting any trouble or indication of trouble that was observed in the course of the trip. The inspector removes this tag, examines any parts where trouble is reported and either has the necessary repair made at once or substitutes another car for the next run. The card itself is filed for reference. Two men fill the gasoline tank and put in oil if any is required, while others inspect the tires; about ten men are employed in greasing the cars. The car moves to its position for receiving passengers five minutes before the time for leaving. “Stages drive through the depot in one direction only, coming in at the Maple Avenue entrance and leaving via the Los Angeles Street exit. The loading platform is just outside the gates from the waiting room and is 8 in. above the level of the driveway. The more frequent service buses pull in against the curb of the loading platform while the long distance cars leave from the space beyond. There is room at this depot for about fourteen cars to stand at one time in the space reserved for cars awaiting passengers. “Tickets are sold in the depot to points in all parts of the state reached by motor buses, and by next summer, when the Pickwick stages are operating over the proposed northern extension of the San Diego-Portland run, through tickets can be purchased from Los Angeles to Vancouver, B. C. The individual cars leaving the depot travel without change to Santa Barbara, 108 miles north on the coast run; to Bakersfield, 140 miles north on the interior run; to San Bernardino, 68 miles east, and to San Diego, 132 miles south. “For the longer trips passengers ordinarily change cars at the points named. 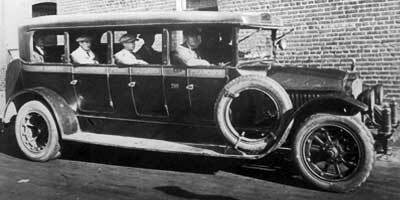 The Pickwick system, however, operates a through car once a day from Los Angeles to San Francisco, 455 miles. When the summer business commences this year, three through-car runs will be put on between these two cities, one being an owl service which will make the run in the night. These through cars will be equipped with reclining chairs. The combined routes in southern California have a total length of about 2,500 miles and offer transportation practically everywhere the roads go. 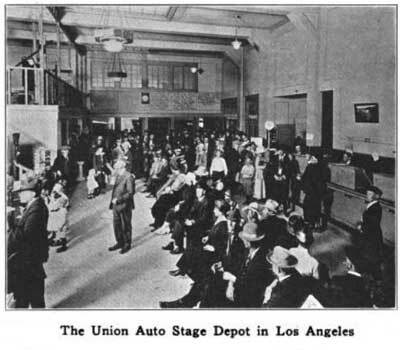 “The Los Angeles Union Stage Depot. The main passenger entrance is at the left, under the words ‘Union Stage Depot.’ The executive offices occupy the second floor of this building. The loaded stages emerge from the double exit at the extreme right. Fuller also remarried in 1920, to Ione Franklin Wright (b. Jun 24, 1892), a divorcee from Arizona (formerly wedded to Vernon S. Wright) and in August 1920 the newlyweds were blessed with the birth of a daughter, Marcellie Fuller. 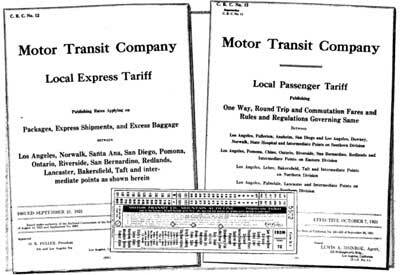 In addition to heading the White Auto Co. and the Motor Transit Co., the 1921 Los Angeles directory lists O.R. Fuller as president and manager of the Union Stage Depot Inc. and vice-president of C.H. & O.B. Fuller Co., his family’s livestock ranching business. “Like the coyote of the desert, from which it takes its name, the new car which the Motor Transit Company of Los Angeles has just turned out from its own shops is always on the job. The traveler between Los Angeles and San Francisco - the ‘Coyote's’ run - may see it, day or night, slipping down grades, running with sure grip up mountainous altitudes or dashing swiftly along the level. It is the very latest word in long distance vehicles, construction and design alike showing the skilled workmanship and the clever brain of the master craftsman. “The eleven-passenger ‘Coyote’ has many points that, especially on this particular route, render it superior to the conventional long distance motor vehicle. Among these are a better road clinging quality; an equilibrium emphasized by more perfectly balanced frame and a lower top. It is mounted upon a special White chassis, equipped with heavy bumpers, strong springs and a reserve fuel tank. “The car itself is distinctive in appearance, its lower body painted blue, its upper body and wheels buff, fenders and running board, black. On the upper body are plainly lettered the terminal and way points of the ‘Coyote’ while, beside the license plate in the rear, is a colored life-like portrait of the little desert animal. On the green glass signal at the top front is the word ‘Coyote’. “In California two men stand out prominently as Captains of Industry in the bus transportation field. To them is due much of the credit for the broad policies in the companies they have organized for the spirit of cooperation between the bus companies and for a higher standard of service that is improving relations with the public. Each of these men has made remarkably rapid progress in the bus transportation field. They are O.R. Fuller and W.E. Travis. During the 1920s the Motor Transit Co. acquired additional operators that handled the Pomona to Chino, Bakersfield to Taft, and San Jacinto, Lancaster, Verdugo Hills and Victorville routes and even ventured into the municipal transit business, operating the Whittier Blvd line in the City of Montebello in the late 1920s. 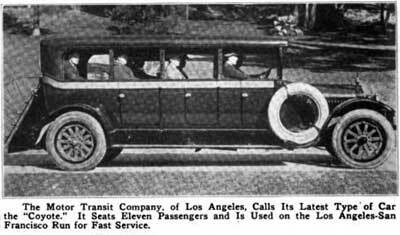 “How motorized transportation has swept to the front in the United States, especially in the West through the application of sound business principles and the elimination of the irresponsible ‘hit-and-miss’ operators is strikingly emphasized in the remarkable development of the Motor Transit Company, with headquarters in Los Angeles, California. This company, 5 years ago, operated a curb service with three buses between Los Angeles and Whittier, a neighboring community. Today it maintains a fleet of 139 stages reaching a territory of 800 miles and branching out in all directions from the metropolis of Southern California. Such is the progress made by this organization which today is the leading automotive passenger carrying company in the West and one of the foremost in the entire country. “The remarkable expansion of the services of the Motor Transit Company, whose stages last year covered 6,054,000 miles and carried a total of 1,500,000 passengers, has not proceeded without encountering serious obstacles. Time and again the company has faced the most severe sort of opposition en-generated by steam and electric railroad interests, which frequently resulted in the competing rail lines in various routes slashing their fare schedules to below operating expenses with a view to crushing the motor stage. “But the popularity of motorized transportation, combined with a vigorous presentation of their ideals by officials of the company, has resulted in the organization coming through the acid test in every instance with renewed vigor. In this connection it is interesting to note that the Motor Company has consistently refused to slash its passenger-carrying rates to below operating expenses during periods of rate wars launched by their rail competitors, and the fact that they did not suffer any appreciable loss of business during such periods justified the position taken. “The Motor Transit Company during recent months has launched some very ambitious services. At the outset these embodied a considerable element of speculation, insofar as public response to the appeal sounded was concerned. But they have invariably been successful. For example, there is now in regular operation a motor bus service between Los Angeles and San Francisco, a distance of approximately 450 miles, which has been unusually well patronized. The Motor Transit Company is able to carry passengers between these two cities for $12.85 one way, or $20.00 for the round trip. “On the Southern Pacific Railroad, the one-way fare is in excess of $17.00. The motor stages leave San Francisco and Los Angeles each morning at 7 o'clock and come through in one day, reaching their destination in between fourteen and a half and fifteen hours, running time, which is about the same time taken by the railroads. The stages make three stops, two to allow the passengers to dine and the other to permit of a little relaxation. “Through connections made by the Motor Transit Company with other motor stages operating in Northern California and in the Northwestern states, it is now possible for a passenger at the Mexican border below San Diego to purchase a ticket with stopover privileges that will take him to Seattle, Washington. From Seattle, this same passenger can continue his journey by motorized transportation, if he desires, to points in British Columbia, Idaho and Montana. “The officials of the Motor Transit Company have found the time of departure a very important element in the successful operation of their various services in California. Take, for instance, the trip from Los Angeles to Bakersfield, over the so-called Ridge Route, a distance of 126 miles. There is considerable travel between these two points. The Motor Transit Company found that for the person in Bakersfield to take a train to Los Angeles he must either get up very early in the morning or wait until the middle of the day or past midnight. “In shaping their schedule of service, the Motor Transit Company arranged to have departures from Bakersfield at the most convenient time for prospective passengers, say at 9 and 10 o'clock in the morning and around 5 and 6 o'clock at night. The officials of the company tested out the sentiment in Bakersfield and by so doing demonstrated that they stood ready to develop their service to the greatest possible satisfaction of the community. The result has been that the Bakersfield-Los Angeles run has been exceptionally well patronized. The same plan of operation has been carried out on other routes with the same profitable results. “At all the leading points in California covered by the buses of this organization, the Motor Transit Company has built, or is building, its own depots. These stations especially those recently completed are a credit to any community. The depots of the Motor Transit Company at such places as Riverside and San Bernardino present the very last word in substantial and attractive features and conveniences for the traveling public. 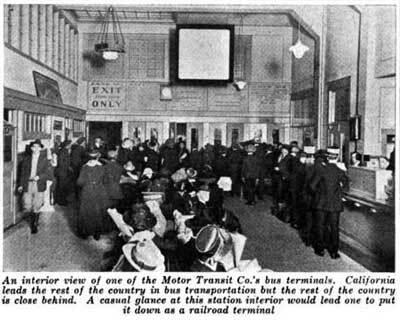 No railroad station is more thoroughly equipped and organized to care for the public than these stations of the Motor Transit Company. “At points where the amount of business does not justify the erection of a depot by the company at this time, or the opening of a company office, an agency is awarded to some establishment conveniently located. The agencies receive a commission of 10 per cent of the first $250.00 gross sales, and 5 per cent commission for gross sales over this amount. “The company has established a fare of 2½ cents a mile on all one-way tickets. The fares do not include the transportation of baggage. The baggage is checked and none will be handled other than by express, except such hand baggage as can be cared for by passengers without inconvenience to other passengers, not to exceed 30 pounds for each adult ticket. “One-way tickets are limited to date of sale, and are honored for passage only on bus for which sold and for which seat space has been reserved where such reservation is necessary. When seat reservation is not required, tickets are limited to thirty days from date of sale. The going portions of round trip tickets are limited the same as one-way tickets. The return portion is limited to 30 days from date of sale. Thirty ride commutation books are issued, which are limited to ninety days from date of sale. “Such commutation books are good for passage of purchaser and members of his or her family when properly signed by each party entitled to use same. “The company requires that all reservations of seat space on one-way or round trip tickets, either going or return portion, reading between Los Angeles and other points where equipment consists of touring cars having seating capacity of 11 passengers or less, must be made at least one hour prior to scheduled leaving time, otherwise the right is reserved to send passengers on next regularly scheduled car. “Reservation of certain seats will not be made by the company. The reservations are guaranteed only when tickets have actually been purchased and seat space assigned. Reservation of seat space is necessary only for transportation between points where equipment used consists of these touring cars. “The company has made an interesting rule in regard to refunds. Tickets of the company's issue will be redeemed to the original purchaser, at fare paid, when no portion of the trip has been made and at the difference between the fare paid and the published tariff fare between the points used if trip was dis continued and not completed, with the following exceptions: Where reservation has been made between Los Angeles and points where the equipment used is limited to a seating capacity of 11 passengers or less, and such reservation is not released one full hour prior to scheduled time of departure of car, for which reservation is made, the refund will be made only of such amount of fare as may have been collected of other passengers occupying said seat between same points or other intermediate points. This is done, however, provided all other seat space in car was occupied and the company was deprived of revenue on account of the failure of the passenger to release reservation. “On special occasions, especially during the height of the tourist season, the Motor Transit Company conducts special excursions to various points of interest which have proven a very profitable side-line. “The carrying of express and excess baggage also provides a sizable revenue for the company. The tariff is somewhat higher than the rail express charges, but the main appeal of the company is the prompt service it is able to render. A garage dealer in Bakersfield, for instance, who is out of a certain automobile part that he needs in a hurry can telephone to a supply house in Los Angeles, which can have it shipped on an outgoing stage to Bakersfield, if it reaches the central Los Angeles depot up to a few minutes before the time of departure. “Express rates quoted are the rates per hundred pounds of normal weight and bulk and value. Where the package is very large, but of little weight or value, the rate quoted is applied to the cubic feet of space occupied by the package (and not the weight) in units of 10 cu. ft. Where the package is small in size and of little weight, but of high value, the rate applied is in units of $100, instead of in units of 100 lbs. or 10 cu. ft. Rates quoted are per 100 lbs., if weight is greater than the bulk or the value; or per 10 cu. ft. if the package is large but of little value and weight; or per $100 if the value be great, but the weight or volume be small; the rate in each case to be applied to the total value, weight or cubic feet of the contents, above and below the unit given, but in no case below a minimum charge that is published. Agents must list in each instance the weight, cubic feet of space and the value of the package offered, and bill it on the unit yielding the highest charges. 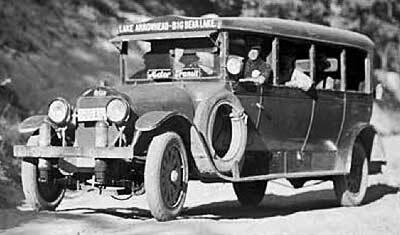 The White Auto Co. also furnished White tour buses to Yosemite and Yellowstone National Parks. 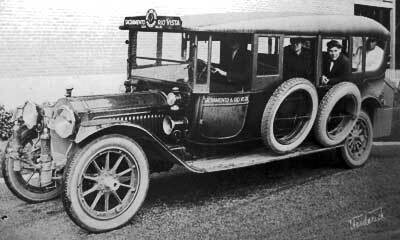 When Moline Plow withdrew from the manufacture of automobiles in 1923 Fuller became the Los Angeles distributor for the Auburn automobile, a similar vehicle manufactured in Auburn Indiana. By that time Fuller was concentrating on his expanding bus business and the day-to-day operations of selling motor vehicles was handled by his long-time friend and business partner, Selig Cahn (b.1869-d.1936), who in addition to being White Auto Co.’s secretary and treasurer had recently become vice-president as well. 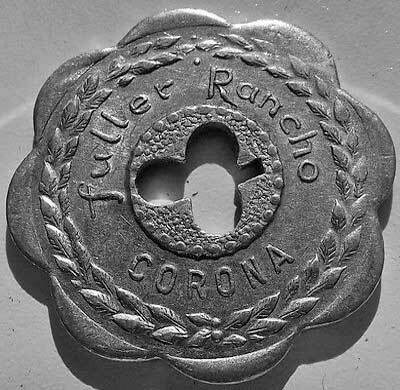 O.R.’s father and uncle continued to head Pioneer Truck & Transfer Co. of which Charles H. Fuller (his father) was president, treasurer and Ortus B. Fuller (his uncle) vice-president until the latter’s October 18, 1922 passing after which the bulk of his estate (including the ranches in Chihuahua and Corona) passed to his brother, Charles. Two years later ill health forced Charles H. Fuller to retire and his son O.R. took over the Corona ranch. In late 1927 O.R. changed its name from the Pioneer Ranch to the O.R. Fuller Rancho and as an initial project expanded its dairy and poultry operations, hoping to extend its distribution territory. By that time the cattle ranch in Chihuahua, Mexico had been sold off and E.P. Fuller, C.H and O.B. Fuller’s younger brother, had moved to El Paso, Texas where he engaged in raising cotton until passing away in 1938 at the age of 70. During 1928 O.R. commenced construction of an elaborately appointed Mission-style ‘hacienda’ (aka ranch house) at the Fuller Rancho which he named Casa Orone (O.R. + Ione). The influx of capital launched a multi-year expansion program that saw Auburn-Fuller Co. establish sales and service outlets in downtown Los Angeles (3465 Wilshire Blvd. ), Hollywood (6145 Hollywood Blvd. ), Beverly Hills (208 N. Canon Dr.) and in 1931 they bought out the Johnson-Blalack Co., San Francisco’s Auburn distributor (1147-1155 Van Ness Ave., Lloyd S. Johnson, manager). Now that E.L. Cord was back in the retail automobile business he kept abreast of what his competitors were doing, especially when it came to advertising. His two main competitors in the high-priced field, Earle C. Anthony (Packard) and Don Lee (Cadillac), spent heavily on radio advertising, an expense that was greatly reduced if you owned your own station, which both men did. 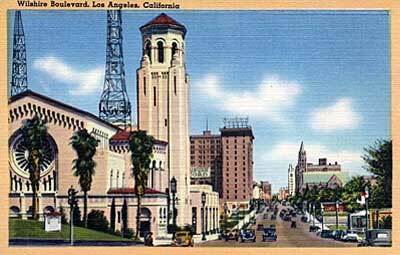 Earle C. Anthony owned KFI in Los Angeles, and a pair of antennas installed on the top floor of his 1000 S. Hope St. Packard dealership relayed those broadcasts to San Francisco’s residents via a pair of antennas mounted on top of his 901 Van Ness Ave. Packard dealership. Don Lee owned KHJ in Los Angeles and KFRC in San Francisco, the latter’s studio residing on the top floor of Lee’s 1000 Van Ness Cadillac dealership, which was just across the street from Anthony’s Packard store and several blocks away from Auburn-Fuller’s northern California headquarters. There was a fierce level of competition between Earle C. Anthony and Don Lee and in February of 1929 Errett Lobban Cord, who had the finances to play with the ‘big boys’, purchased his first radio station, KFVD, from the McWhinnie Electric Co. 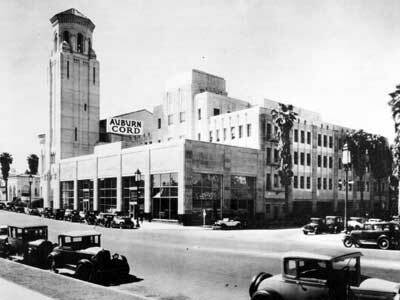 The purchaser of record was the Auburn-Fuller Co. and in March, 1929 the station’s license was altered to reflect that KFVD was now owned by the Los Angeles Broadcasting Company, a new wholly-owned subsidiary of the Auburn-Fuller Co. The studios were located at the Hal Roach studio complex on Washington Blvd. in Culver City. Primarily a popular music station it broadcast classical music that featured various ‘Auburn’ branded orchestras as well as comedy shows featuring some of the Hal Roach studio stars. 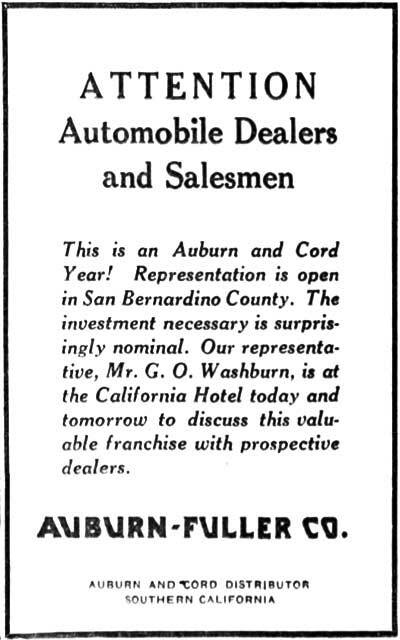 “One of the most important changes in Pacific coast automobile distributorships was revealed today by Charles A. Clark, western representative of the Auburn Automobile company, in an announcement of the acquisition of Auburn-Fuller company of Los Angeles of the exclusive distributorship of Auburn, Cord and Duesenberg automobiles for the entire state of California, succeeding the Johnson-Blalack company, who formerly held the distributorship for the northern part of the state. “In making the announcement, Clark stated that O.R. Fuller, head of Auburn-Fuller company, and widely known for his successful automobile merchandising methods would direct the entire operation of this immense retail automobile selling organization, and that Lloyd S. Johnson, former distributor, would be the general manager of the Auburn-Fuller company for the northern part of the state. That last sentence did not hold true as B.H. Rogers, the longtime Auburn distributor located at 3020 Broadway, Oakland, was forced out in January of 1932 and replaced by an official Auburn-Fuller Co. operation located at 2111 Webster St., (cor. of 21st St.) Oakland, which was managed by R.L. Marston. "Auburn-Fuller Co., O.R. Fuller, pres; H.A. Andrews, V-Pres. ; V.J. Mapes. Sec., Walter Peterson, Treas. 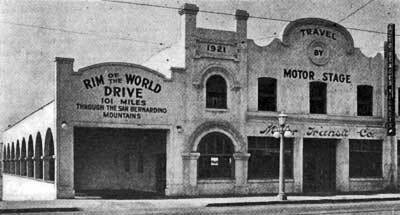 ; Automobiles, 3465 Wilshire Blvd., Tel Trinity 2621; 1101 and 1800 S. Figueroa; 6145 Hollywood Blvd., 208 N. Canon Dr., Beverly Hills." 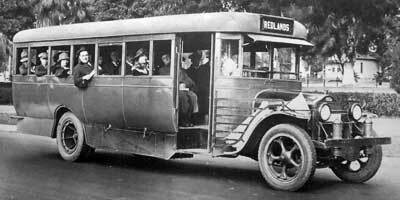 During the mid 1920s Motor Transit Co. offered direct service to the following Southern California Communities: El Monte, Sunland, Whittier, Pomona (all Los Angeles County); Fullerton, Anaheim (Orange County); Ontario, San Bernardino, Lake Arrowhead, Redlands, Big Bear Lake (all San Bernardino County); Riverside (Riverside County); Bakersfield, Taft (all Kern County); and Oceanside, La Jolla and San Diego (all San Diego County). During the late 1920s transit passengers faced a bewildering array of bus companies, fares and service area restrictions. 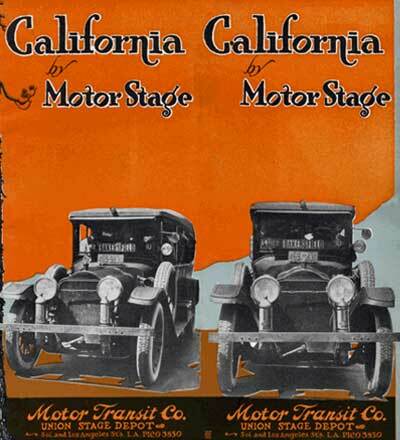 In order to make life easier for all, In 1926-1927 the California Motor Carriers Association divided the market amongst the three largest operators: Motor Transit Co., California Transit Co. and Pickwick Stages. The Tri-Stage Merger, as this agreement was called, mandated that Motor Transit Co. give up its long-distance routes to Lancaster, Bakersfield and San Diego and became a suburban bus line serving Los Angeles, Orange, Riverside and San Bernardino Counties. In exchange, Motor Transit gained the rights to carry local passengers anywhere in its system. The merger required Motor Transit divest its Bakersfield route to the California Transit Co., which would now connect Northern and Southern California via the Central Valley Pickwick Stages, which had recently acquired the Orange County routes of Crown Stages. Fuller’s father, Charles H. Fuller, died on Aug. 27, 1929 and on April 3, 1930 O.R. Fuller sold the Motor Transit Co. to Pacific Transportation Securities, a holding company controlled by Greyhound, Pickwick and Southern Pacific. The purchase was part of Greyhound's scheme to nationalize the country's small operators into one cohesive coast-to-coast bus system operating under the Greyhound banner. At the time Southern Pacific, Santa Fe and other regional railroads were replacing poorly-performing railroad feeders with buses, greatly increasing their bottom lines. Fuller received a small amount of cash and a reported $3 million in stock from the sale and remained on the board of directors of Motor Transit. Pacific Transportation Securities subsequently renamed itself Pacific Greyhound Lines and eventually sold off most of Motor Transit’s routes to the Pacific Electric Co.
Once his father’s estate was settled, Fuller legally inherited the 3,000 acre Fuller ranch which was located 6 miles northwest of the City of Corona in what is now Eastvale, California. Cord, as enthusiastic about airplanes as he was about automobiles, entered the airline business in 1930. Century Airlines served the Midwest from a Chicago hub; Century Pacific flew from Grand Central Airport in Glendale to San Diego, Bakersfield and San Francisco. Both airlines used ten—passenger Stinson aircraft. 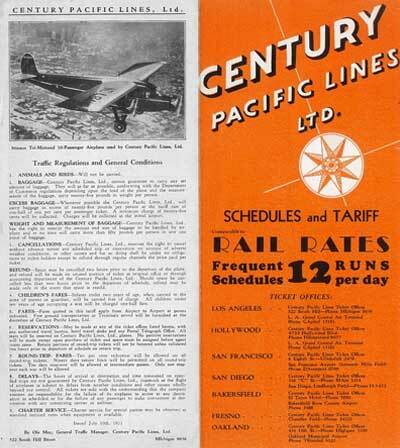 Cord appointed Fuller president of Century Pacific Lines, a small commuter airline formed in 1931 to compete against rail and bus lines in the profitable California / Arizona corridor. Cord insisted that his employees work long hours at low wages. It was no different for the Century pilots, whom Cord considered 'glorified chauffeurs' and paid at about half the normal rate. At first, the pilots were glad to have any job they could get and suffered in silence. But when Cord announced further wage cuts in 1931, the Chicago—based pilots went on strike. Cord kept expenses low, not only to compete with rail fares but also to offer a low bid on a U.S. Post Office airmail contract. However, Cord’s business practices made him no friends with the government. U.S. Post Office officials noted that the pilots were so demoralized they flew unsafely, threatening the stability of the entire airline network. During the strike, Cord often referred to the striking pilots as 'Reds' and 'Communists' offending other government officials enough to prevent him from ever receiving another airmail contract. Relations with Cord and O.R., who had initially admired each other, deteriorated. O.R. questioned Cord’s treatment of the Century pilots, the Auburn factory workers and the Auburn dealers. 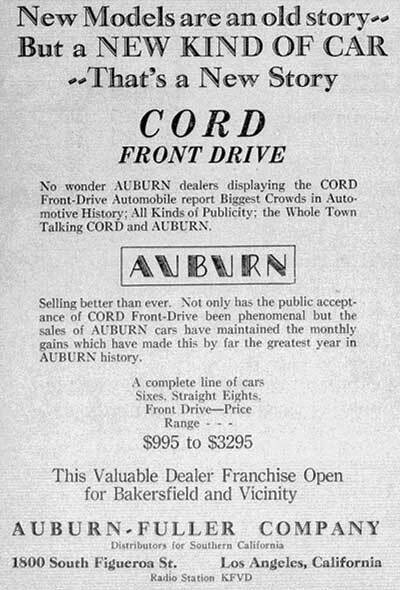 Cord forced dealers to stock impractical, poorly selling models and balked at providing repairs when those cars developed mechanical problems. 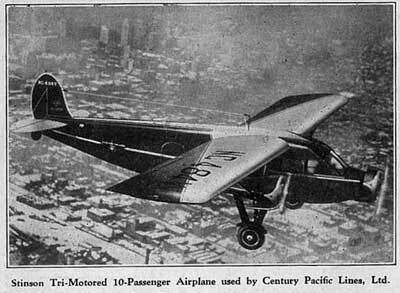 Century Pacific used a small fleet of E.L. Cord-built Stinson aircraft and in early 1932, Aviation Corp., (AVCO) the parent company of American Airways, launched a hostile takeover of both Century Pacific and Century Airlines by creating a labor dispute with Century’s pilots. Cord was not amused and spent the next few months secretly purchasing large chunks of Aviation Corp. stock. At AVCO's fall board meeting, its directors were unpleasantly surprised to learn that Cord was now Aviation Corp’s majority stockholder (34%), which effectively gave him control over Century and American. On January 29, 1932 a Century Pacific airplane crashed in the mountains south of Bakersfield, killing all aboard. Because of bad weather and rough terrain, five days passed before the victims were found. Although Motor Transit buses had been involved in the occasional accident, nothing as serious as this had ever happened while O.R. owned the bus company. On or about May 12, 1932, Fuller received a letter threatening him with death unless he provided $50,000. The letter closely followed the news that the remains of aviator Charles Lindbergh’s kidnapped son, Charles Augustus Lindbergh Jr., had been discovered just four miles from his N.J. home. “Los Angeles, May 16 - (UP) — O. R. Fuller, millionaire head of the Auburn-Fuller Motor company, was revealed today as the intended victim of a $50,000 extortion plot following the arrest of Carl Poehnl, a former chauffeur in his employ. By mid—year Century Pacific Airlines had gone out of business, and Auburn—Fuller went into receivership. “In equity No. 3287-5 Order limiting time for presentation of claims. “In the district court of the United States, Northern District of California, Southern Division. “Wake Development Company, a Delaware corporation and Pacific Finance Corporation of California, a Delaware Corporation, Complainants, vs. Auburn-Fuller Company, a California corporation, defendant. “This cause came on to be heard this 24th day of June, 1932, on the application of Maynard McFie, Ancillary Receiver, for an order limiting time for the filing of claims against the receivership estate herein, and upon consideration thereof and good cause appeals. Much of O.R.’s wealth was in stock, which were by now nearly worthless. He did not bother to attend the Century Pacific dissolution hearing on July 13, 1932 where Cord and his lawyers tried to prevent O.R. from getting his share of airline stock. By the end of the year Fuller had either sold off or been relieved of his transportation-related business activities and withdrew to his father’s 3,000 acre ranch north of Corona, California. 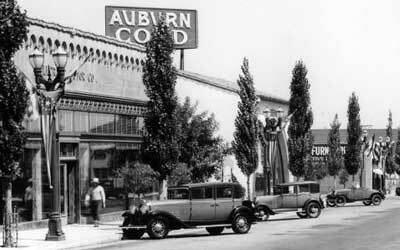 The Auburn-Fuller Co. was gone from the 1933 San Francisco directory which lists the E.L. Cord-controlled Auburn Sales Co. at 1147-1155 Van Ness Ave., with H.B. Liggett, manager. "Auburn California Company, Distributors Auburn, Cord and Duesenberg Motor Cars, Main office 3443 Wilshire Blvd., Tel Fitzroy 3123, Branch 1366 S. Figueroa, Tel Prospect 4818." The firm's branch facility at 1366 S. Figueroa St. formerly housed Unger & Watson Inc., a distributor of radio sets, equipment and automobile accessories and was eventually razed for use as a parking lot which is located directly across the street from the Los Angeles Convention Center. 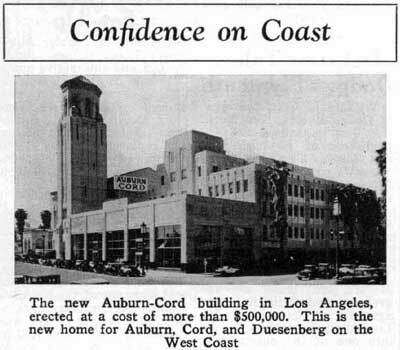 "Auburn Automobile Sales Corporation, California Branch, Distributors Auburn, Cord and Duesenberg Motor Cars, Main office 3443 Wilshire Blvd., Tel Fitzroy 3123, Branch 1366 S. Figueroa, Tel Prospect 4818." By late 1932 the Depression had also put a severe damper on Duesenberg sales and unsold chassis were piling up in Indiana. Things were just as bad at many of the firm’s authorized coach builders, Walter M. Murphy in Pasadena closed down that year and many others were close to bankruptcy. Designs and bodies in the white dating from the early thirties were mothballed until sales slowly began to pick up in 1934. 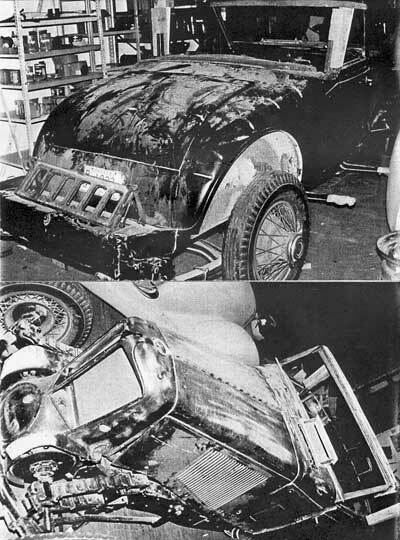 Although Duesenberg sales nationwide were almost non-existent, the Auburn Automobile Sales Corp., Calif. branch, had some luck selling new ones providing their coachwork was updated to match the competition's which at a bare minimum required adding skirts to the front fenders. Much of the updating was done by Bohman & Schwartz, a Pasadena firm founded by two former Walter M. Murphy employees. 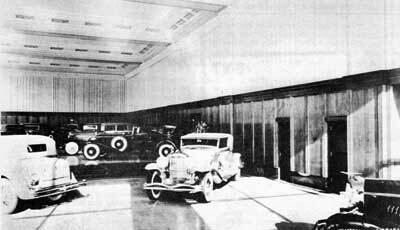 When Murphy closed down, a number of customer’s cars (for example Eddie Peabody and Gary Cooper's Duesenbergs) remained uncompleted, and two former Murphy employees, Christian C. Bohman and Maurice L. Schwartz offered to complete the work in their own small shop. They named their firm Bohman & Schwartz, and rented a building in back of Prosser's Garage at the intersection of DeLacey and Green Streets in Pasadena. Bohman ran the sales and accounting office, while Schwartz ran the shop and did almost all of the bodybuilding. They purchased some of Murphy’s shop equipment at auction and hired a number of ex-­Murphy employees, including Milt Pfeiffer, Mark Farlow, Whitey Compton and Jack James. With a much more modest overhead, the pair were successful in establishing both a fine reputation as coachbuilders and they succeeded as a team for twelve more years and then independently for another seventeen years. Rudy Stoessel, Paul Erdos and Oscar Haskey all worked at Auburn-Fuller Co. at various times as did Burton K. Chalmers, auto salesman to the stars. All four eventually worked at Darrin of Paris and after it folded in 1939 they formed Coachcraft Ltd. at 8671 Melrose Avenue, Hollywood, California. 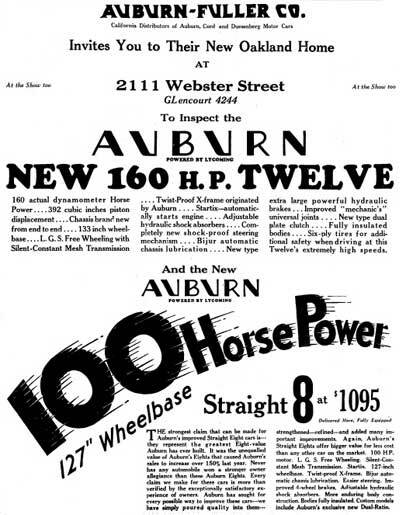 As the official name of Auburn-Fuller changed several times following its bankruptcy, most of its LA customers continued to refer to the firm as Auburn-Fuller into the late 30's. 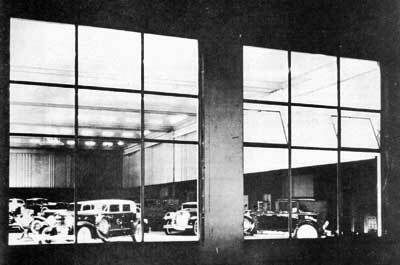 After E.L. Cord's automobile manufacturing business collapsed, the showroom at 3443 Wilshire was discontinued and the service department relocated one block north to 3479 W. 6th St. where it remained into 1940 when it too was discontinued. 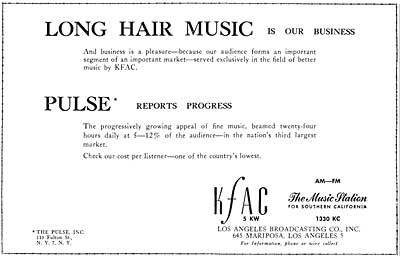 When Auburn-Fuller entered into bankruptcy proceedings, E.L. Cord purchased its Los Angeles Broadcasting Co. subsidiary from the receiver. 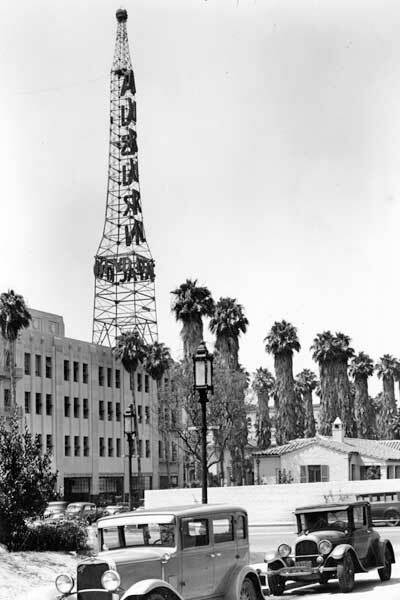 In late 1936 Cord sold KFVD, the lower-powered of his two stations, to Frank Burke’s Standard Broadcast Co., who relocated it 338 S. Western Ave. Cord switched KFAC to an all-classical format in 1945 and added an FM station, KFAC-FM in 1952. He retained ownership of Los Angeles Broadcasting Co. until 1962 when he sold it for $2 million. O.R. 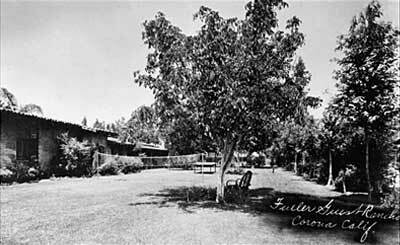 Fuller expanded the ranch by leasing adjacent property until it grew to almost five thousand acres. 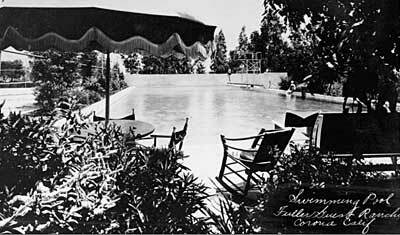 And although the lived in Beverly Hills, the Fuller family enjoyed spending weekends at the ranch and in 1928 commenced the construction of an elaborate ranch house named Casa Orone (combining O.R. and Ione). “Mr. O.R. Fuller, who operates a 5,000 acre ranch near Corona, appears to me to be a man of vision. As I talked to him, it seemed to me that the fever of the much talked of depression slipped off and things looked much brighter. “It is a well-known fact that no concern is bigger than the head of it – that the very personnel and operation reflects the thought and action of that head – it is undoubtedly true of the Fuller RanchO. “From the time one enters the doors of the office one is impressed – first by the courtesy of those receiving one; next the orderliness and cleanliness of the institution, and upon being shown through the plant this impression was confirmed. “Before I had finished a tour of the immense properties, accompanied by Mr. Fuller’s genial superintendent, Jim Coveny, I was amazed at the outlay and effort which created an institution such as this. “Perhaps the average Coronan does not realize that the Fuller RanchO has now approximately 3,000 acres under cultivation; 800 additional acres being cleared and leveled for a 1932 crop; a 200-inch well being drilled which will add to the 12 wells pumping from 100 to 300 inches, all supplied with modern equipment for irrigation purposes. “At the present time the dairy herd numbers about 1400 animals, representing Holsteins, Jerseys, and Guernseys. There are more than 500 cows milked. Milk and cream distributed in Corona and surrounding territory is of the highest quality and the demand is growing steadily. The sanitary methods surrounding the operation and handling of milk and cream is best demonstrated by the thoroughness of the various operations making for cleanliness and purity. Their entire herd is inspected at frequent intervals by county, state, and national government authorities. “Too much cannot be said of the Fuller RanchO poultry plant which now consists of about 7,500 Rhode Island Red and White Leghorn chickens. The poultry plant is being increased each year and eventually quarters for 20,000 layers will be filled. The eggs and meat birds are to be sold to customers of Corona and surrounding cities. “Another unique sideline to this immense institution and which, to my mind, emphasizes the human element entering into the operation and success of the Fuller RanchO, is the wild bird farm where some 800 birds of various breeds, such as pheasants, quail, peafowls, and guineas, all find a home undisturbed. “Turkeys, too, are raised in great numbers, fattened and prepared for your and my consumption. Fuller also built up its poultry business and within a few years had become one of the largest turkey ranchers in Southern California. Fuller Rancho trucks delivered milk and eggs all over Southern California. O.R. opened the Fuller Rancho Market, a drive—up grocery store, in Pomona. To produce additional income, Fuller converted the Casa Orone hacienda into Fuller Guest Rancho in 1937, which with a few additions provided overnight accommodations for 25 guests. Its customers were treated to an Olympic-sized swimming pool, a poolside bar and a 5-star restaurant. More adventurous guests could take a cruise on the nearby lake or tour the countryside on horseback. However, the Ranch’s biggest attraction was its illegal gambling, with card tables and slot machines designed to he quickly hidden if a law enforcement agents paid a surprise visit. O.R.’s daughter Marcellie recalled that many famous and not-so-famous celebrities frequented the Rancho, the most well-known visitors being Linda Darnell, Olivia deHavilland, W.C. Fields, Rochelle Hudson, Garson Kanin, Jeanette MacDonald Groucho Marx, Ken Murray, Jack Oakie, Mary Pickford, Gene Raymond, Charles ‘Buddy’ Rogers, Red Skelton, Elizabeth Taylor, Spencer Tracy and Claire Trevor. “Hollywood, Calif. – (AP) – Charley Grapewin is going to fish this summer from his own private lake front. He says he won it in a poker game. “And to hear the 67 year old move character star tell it, it was some game. “He’s up visiting his old friend, O.R. 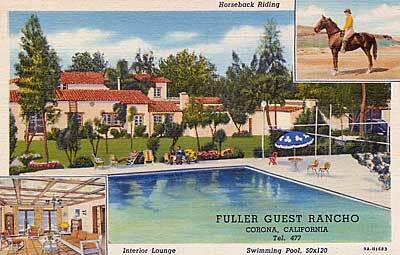 Fuller, who operated a guest ranch at Corona, some 50 miles from the movie lots. One night he’s playing Ollie Fuller a game of seven card stud. “‘I’m sitting there with the 10 and jack of hearts showing,’ Charley tells it, ‘and Ollie has one ace up. Ollie deals the cards and I draw the king, queen and nine of hearts. I don’t know what he’s draw in the hole, but pretty soon we’ve got all the cash in our pockets on the table. We’ve got an agreement against checks and IOU’s, so that looks like the end of it, but neither of us wants to quit. “‘I’m looking out the window at the lake and see the prettiest two acre point out there you ever saw. I tell Ollie I’ll be him my house in Los Angeles – it’s a nice house – against that two acres. “That was nine months ago. Today the concrete has already been poured for the foundations of the Grapewin home on the lake. “But look here Charley! What did Mrs. Grapewin say about putting her home in a poke pot? “O. R. Fuller, Head of Famed Rancho, Died on Tuesday - With Father Operated Bus Line That Now Is Pacific Electric. “O. R. Fuller, proprietor of the Fuller Rancho, one of the outstanding guest homes of Southern California, died at 10:45 p.m. Tuesday at his home about four miles north of Corona. For the past several months Mr. Fuller had been in failing health and for the past few days he had been sinking rapidly. Born in Kansas, October 5, 1880 as Olive R. Fuller, he was the son of early California residents, Mr. and Mrs. Charles H. Fuller. He was known better as ‘O. R.’ or ‘Oliver’. He is survived by his widow, Mrs. Ione Fuller, and his son-in-law and daughter, C. Clifton Towers and Mrs. Marcellie Fuller Thompson of Long Beach, and his grandson, Fuller Clifton Thompson. There are no surviving brothers or sisters. “The vast Fuller Rancho of seemingly unending acres with its private lake, the Tavern-On-the-Lake, until recently operated by George Dawson, the Charles (‘Grapes of Wrath’) Grapevine residence to the west of the Fuller Rancho and the hundreds of acres devoted to farming have constituted a Corona landmark for a half century. Formerly the Fuller Rancho was the home of one of the largest turkey farms in Southern California. More recently the poultry farm operations and production of grain have been the most important. 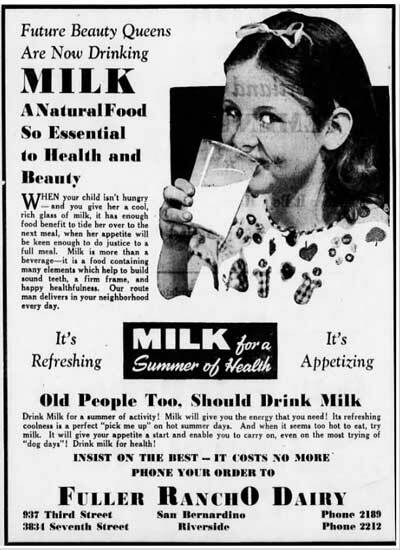 At one time there was a large Fuller Rancho dairy farm in operation. “Charles Fuller, the father of ‘O.R.’, was one of the largest early day dealers in automobiles and trucks in Los Angeles, being engaged in that business for a quarter of a century. He purchased the farm, however, more than 50 years ago and operated that as a ‘hobby’ along with his important automobile and truck business. Later he was the sole owner of the Motor Transit Bus Lines, operating the big red buses which served the southern part of California, including Corona, Riverside, San Bernardino and intermediate points to Los Angeles and far beyond. This is now the Pacific Electric railway, owned by the Southern Pacific. In order to settle the estate her home and what remained of the original Fuller Rancho property was sold to Walter Koenig, a local dairyman, who subsequently resold most of the land for agricultural use. The hacienda was purchased in 1959 by the Good Samaritan Center, a Lutheran retirement facility that housed 66 seniors until 1967 after which it served as the home of the St. Katherine’s Home for Boys, a youth counseling facility operated by the Greek Orthodox Church. In 2004 the property was razed and divided into parcels and redeveloped into tract housing. In 2010 the original 3,000 acres that made up the Fuller Rancho and its surrounding area were incorporated as the City of Eastvale, California.